A bratwurst is a sausage usually composed of veal, pork or beef. The name is German, derived from Old High German brätwurst, from brät-, which is finely chopped meat and -wurst, or sausage. 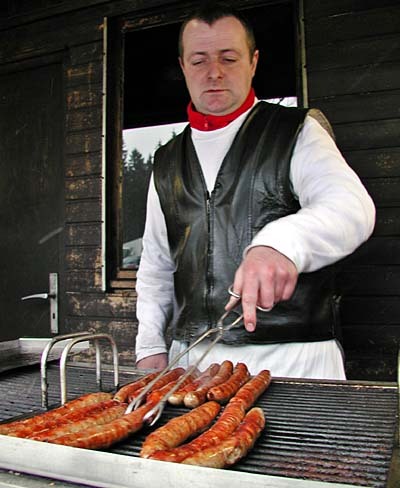 Bratwurst are usually grilled and sometimes cooked in broth or beer. 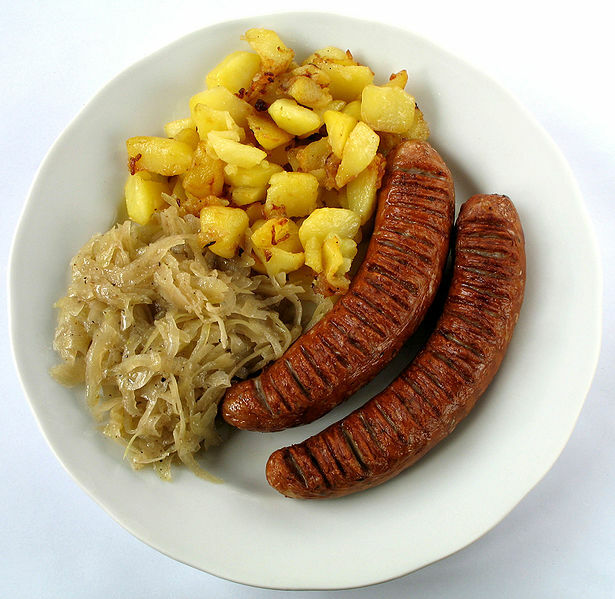 Left: Bratwurst with sauerkraut and potatoes. How the sausage is served varies by region. In Thuringia, it is often eaten with hot German mustard in a bread roll or Brötchen. There and further south, the bratwurst is often served "pinched" in a bread roll, much like a forerunner of the American hot dog in a bun. It is a very popular form of "fast food" in German-speaking countries, often cooked and sold from small stands and street vendors. Recipes for the sausage can also vary; some sources list over forty different varieties of German bratwurst. Bratwurst is mentioned in documents for the first time in 1404 in Thuringia. The Thüringer Rostbratwurst is thus, perhaps, the oldest known Bratwurst in Germany. It is long (15-20 cm) and thin in shape. Traditionally, it is grilled over a charcoal fire and eaten with mustard and bread.